The spotted oleander caterpillar moth, Empyreuma pugione (Linnaeus), is one of only three species of Lepidoptera that may be found feeding on oleander in Florida. This arctiine species is considerably less common and less destructive than the oleander caterpillar, Syntomeida epilais Walker. The spotted oleander caterpillar may be mistaken for the saltmarsh caterpillar, Estigmene acrea (Drury). 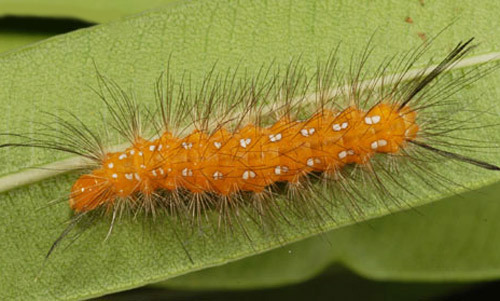 However, the body of the saltmarsh caterpillar is densely covered with hairs whereas the spotted oleander caterpillar only has tufts of hairs on its body. It is important to be able to distinguish among these three species as the nonpestiferous spotted oleander caterpillar and saltmarsh caterpillar will not require control measures whereas the oleander caterpillar may. Figure 1. Adult moth of the spotted oleander caterpillar, Empyreuma pugione (Linnaeus). Photograph by James Castner, Univeristy of Florida. The spotted oleander caterpillar is a recent immigrant to the United States, first recorded in Florida in Boca Raton, Palm Beach County, in February 1978. The spotted oleander caterpillar's distribution within Florida is quite limited, being relatively common only in the Keys and south Florida. It is a native of the Caribbean region and has been recorded from Guadeloupe, Martinique, Haiti, Dominican Republic, and Cuba. 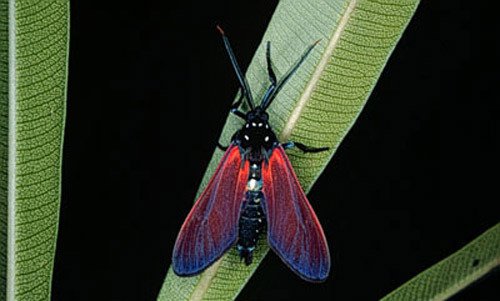 Adult: The adult moth has a wingspan of 43 to 48 mm. The antennae are bipectinate and black in color with metallic blue highlights and orange tips. The male moths are distinguished by having slightly longer pectination on their antennae than the females. The body is dark brown with metallic blue highlights. There is a series of small white spots down the dorsum of the thorax and along the sides of the abdomen. The forewings are light chocolate brown with a border fringe of deeper brown. The area between the costal and subcostal veins on the forewing is carmine red. The hind wings are entirely carmine red with a deep brown border fringe. Egg: The eggs of the spotted oleander caterpillar are similar in appearance to those of the oleander caterpillar. They are pearly white, turning to yellow just before hatching, spherical, and about 1 mm in width. Larva: The larvae are light orange, hairy caterpillars. They have tubercles on the lateral and dorsal regions of each segment from which protrude tufts of stiff reddish-brown hairs. On the mesonotum, metanotum, and the eighth abdominal segment, there is a pair of longer stiff black hairs. Six rows of regularly spaced large silver-colored spots ringed with dark brown form discontinuous longitudinal bands along the entire length of the caterpillar's body. Figure 2. Larva of the spotted oleander caterpillar, Empyreuma pugione (Linnaeus). The head is to the left. Photograph by Lyle J. Buss, University of Florida. Pupa: The pupa is very similar in appearance to the pupa of the oleander caterpillar. The smooth, cylindrical pupa averages 16 mm in length and is dark reddish brown in color. It is usually covered by a thin cocoon formed of larval body hairs and silken threads. Adults of the spotted oleander caterpillar are day-flying moths. A male locates a female moth from several meters distance by cuing in on her sexual pheromone. Close-range mate location is facilitated by ultrasonic acoustic signals that both sexes emit. Mating occurs just around sunrise. The mated female moth searches for a site to lay her eggs, usually the underside of an oleander leaf. She lays her eggs in a group, as does the oleander caterpillar, but her progeny feed singly rather than gregariously as does the oleander caterpillar. The life cycle and developmental period of the spotted oleander caterpillar are essentially the same as those of the oleander caterpillar. Larvae develop through six instars and total larval development averages 28 days, depending on the temperature. Sixth instar larvae leave the host plant and search for a suitable site for pupation. The spotted oleander caterpillar pupates alone however, rather than in a large aggregation as does the oleander caterpillar. Oleander is the only recorded host plant of the spotted oleander caterpillar. However, these caterpillars rarely cause severe damage to ornamental plantings in Florida because they are relatively rare compared to the oleander caterpillar and feed solitarily. Control of the spotted oleander caterpillar is not necessary. In fact, in many countries where the two oleander caterpillars are sympatric, the gregarious oleander caterpillar has outcompeted and displaced the solitary spotted oleander caterpillar. Parasitic wasps in the scelionid family have been reared from egg masses of Empyreuma pugione. It is likely that the naturally occurring predators, parasitoids, and pathogens that attack the oleander caterpillar in Florida will also attack the spotted oleander caterpillar. Adams RM, Goss GJ. 1978. Empyreuma pugione L. (Lepidoptera: Ctenuchidae) - A new U.S. introduction. Florida Entomologist 61: 250. Chalumeau F, Benito-Espinal E. 1984. Two species of Ctenuchidae (Lepidoptera), pests of the oleander in French West Indies. Bull. Soc. Linn. Lyon 53: 175-182 (in French). Chalumeau F, Delplanque A. 1978. Catalogue commenté des Ctenuchidae (Lepidoptera) des Antilles françaises. Bull. Soc. Linn. Lyon 4: 176-187. Otazo A, Portilla N, Coro F, Barro P. 1984. Biology and behavior of Empyreuma pugione (Lepidoptera: Ctenuchidae). Cienc. Biol. 11: 37-48 (in Spanish). Otazo A, Portilla N, Coro F, Barro P. 1987. Role of olfaction and audition in the mating behavior of Empyreuma pugione (Lepidoptera: Arctiidae). Cienc. Biol. 17: 42-48 (in Spanish). Weller SJ, Simmons RB, Carlson AL. 2004. Empyreuma species and species limits: Evidence from morphology and molecules (Arctiidae). Journal of Lepidopterists Society. 58(1): 21-32. Publication Date: November 1997. Latest revision December 2014. Reviewed January 2018.